Danish educationist and author; born in Copenhagen April 22, 1803; died there March 23, 1891; educated at the University of Copenhagen (B.A. 1823). 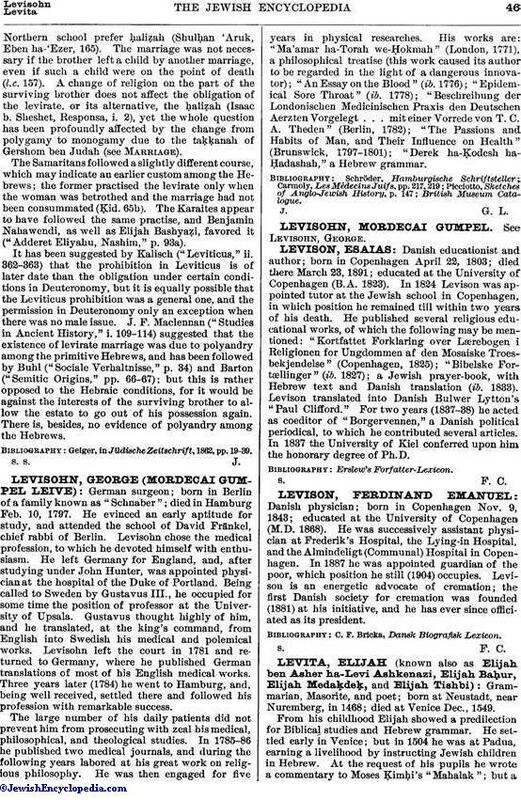 In 1824 Levison was appointed tutor at the Jewish school in Copenhagen, in which position he remained till within two years of his death. He published several religious educational works, of which the following may be mentioned: "Kortfattet Forklaring over Lærebogen i Religionen for Ungdommen af den Mosaiske Troesbekjendelse" (Copenhagen, 1825); "Bibelske Fortællinger" (ib. 1827); a Jewish prayer-book, with Hebrew text and Danish translation (ib. 1833). Levison translated into Danish Bulwer Lytton's "Paul Clifford." For two years (1837-38) he acted as coeditor of "Borgervennen," a Danish political periodical, to which he contributed several articles. In 1837 the University of Kiel conferred upon him the honorary degree of Ph.D.